Looking at some of the other guests at a recent launch event at Hoxton’s PEER Gallery, you got an eerie feeling: the inkling that you’d seen them before, somewhere, but that on the previous occasion their heads had been several orders of magnitude larger and perched some storeys off the ground. 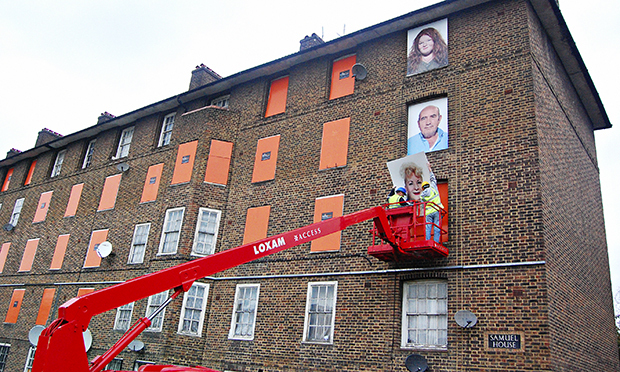 This is because they were the subjects of person-size portraits which used to be installed in the windows of Samuel House, a Haggerston housing block (now demolished). These portraits are included in Real Estates, a six-week project at PEER curated by Fugitive Images, the art collective that made them along with a film about Samuel House called Estates: a Reverie. Community participation is key to Fugitive Images’ work, which takes a particular interest in what they call “the social organisation of urban space”. And given the chance to organise their own small piece of urban space at PEER they have done so in a decidedly social way, inviting a host of other artists, campaigners and local people to join in over Real Estates’ six week duration, dividing up the time between different exhibitors. Combined with PEER’s only being open three days a week this can make for a rather fleeting schedule, but also means high variety along with cultural air-time and direct participation for groups that might otherwise be sidelined or made purely passive contributors. Thus March will see Bekki Perriman’s The Doorways Project, exploring “homeless culture”, the generally ignored day-to-day activities and stories of people living on the street, accompanied by work from Cardboard Citizens, a group which has been making theatre with homeless people for over 20 years, for homeless and non-homeless audiences. The E15 Campaign – who came to national prominence last year as the ‘E15 Mothers’ protesting their eviction from social housing in Stratford – will exhibit visual art and film about their campaign as well as running “eviction resistance” workshops, while the DIG Collective, a social housing campaign group, will have their own slot in mid-March. Smart Urhoife, a fashion designer who grew up in Haggerston, will be exhibiting work from 25 – 28 March. As well as exhibitions open throughout the day, Real Estates will host evening talks, discussions and films. It’s got the potential to be a kind of short-course in where social housing and the campaigns around it are at in 2015. There’s a full schedule and an online continuation of the project at real-estates.info.